A crucial stage in the growth and development of pigs, the weaning period, can present challenges that need to be dealt with correctly in order to avoid production issues. Providing a smooth transition from liquid to solid food is key in optimizing your growth cycles and making sure your animals meet the average market hog weight. Below we discuss when to wean piglets, and offer some tips on a successful transition. 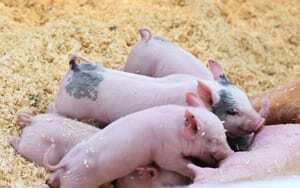 All of the above are tell-tale signs that your piglet is ready to be weaned. Depending on the breed of pig, this can be anywhere from 4-8 weeks of age. If you have a sow that is being severely depleted by a large litter, you can wean the most independent and largest sized piglets quicker than the rest, preferably not before the 4 week mark. The only exception to this if you feel it is crucial for the health/survival of the sow. Introducing dry creep feed to piglets can help them become accustomed to the new feed when it’s time to wean. Place 1 ½ – 2 ½ pounds of dry feed in their crates, anywhere between three to five days before you wean. Select a feed that contains highly digestible ingredients and also tastes and smells like sow’s milk. It’s important to continue feeding your piglets a similar starter feed through the weaning transition. When the piglets move to the nursery or wean-to-finish facility, be sure to select starter feed that is similar in taste to the creep feed you introduced to your piglets. Taste is important to piglets. They have to like what they are eating to continue to return to the feeder. As soon as the piglets arrive to the new nursery or wean-to-finish facility, make sure to put out fresh feed both in feeders and sparingly on mats. Pigs are more likely to eat in groups, so concentrate on a group routine to encourage eating throughout the day. Make sure fresh feed is available throughout the day, and make sure to show the pig can easily find the mats, feeders and water. When the piglets are moved into the nursing facility, the rooms need to be disinfected and cleaned. Make sure the rooms are dried after they are cleaned. Pigs need warmth. Rooms should be no colder than 77 F to avoid health problems with your piglets (read more on pig temperature requirements).